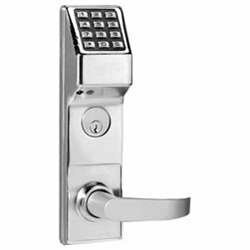 The Alarm Lock Trilogy T3 weatherproof electronic digital keypad mortise lock leverset supports up to 300 user entry codes for secure keyless entry, is for installation on exterior and interior doors, has a satin chrome finish and a lever handle for left-hand operation. The leverset can be manually programmed through the keypad or a computer to recognize up to 300 user entry codes of 3 to 6 digits, and can store up to 500 lock/unlock events grouped into schedules to permit or deny access at specified times and days. It maintains a time-stamped audit trail record of the last 40,000 occurrences of successful and unsuccessful entry, which can be retrieved to a computer or printed to an infrared printer (sold separately). An automatic lockout disables the keypad up to 60 seconds after multiple failed code inputs, to discourage unauthorized access. LED indicators and sound provide feedback for code entry and manual programming. Programming through a Windows-compatible computer requires the Trilogy PC Software Kit (sold separately). The leverset has a mortise lock mechanism that fits in the recess of a standard door stile. The classroom function latch locks the exterior handle for secure entry, while the interior handle remains unlocked for egress. A solid brass fixed key cylinder provides a key override to engage or release the lock. The leverset is rated for temperatures from -31 to +151 degrees F (-35 to +66 degrees C) for use on exterior, as well as interior doors. The leverset trim is made of stainless steel with a satin chrome finish to resist corrosion. The leverset is powered by 5 AA batteries (included). It meets American National Standards Institute (ANSI)/ Builders Hardware Manufacturers Association (BHMA) grade 1 standards for commercial buildings, and standards that can help comply with the Americans with Disabilities Act (ADA) when properly installed. It is also Underwriters Laboratories (UL) listed for a 3-hour fire rating and Federal Communications Commission (FCC) certified. Fits door thickness 1-5/8 to 1-7/8"
Manufacturer: Alarm Lock Systems, Inc. Publisher: Alarm Lock Systems, Inc. Studio: Alarm Lock Systems, Inc.
Aiphone Corporation IS-IPDV IP Addressable Video Door Station for IS Series IP Video Intercom, Aluminum Die Cast, 8-1/2" x 4-3/16" x 1-1/8"